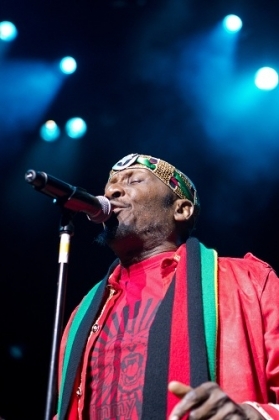 Tonight's show at the IndigO2 was Dr Jimmy Cliff - a Reggae legend, familiar to reggae lovers and to fans of movies including "Cool Runnings" which featured him singing "wild world" and "I can see clearly now". There was no support act but instead we had a DJ till shortly before the main event. The show started with the band coming on stage dressed identically in black trousers and yellow T-shirts before Jimmy Cliff came on in a bright red outfit. Kicking off with "You can get it if you really want", Jimmy Cliff had the crowd cheering and dancing almost immediately. During the show he dedicated the song "Treat the youths right" to "the riots that have been going on here". Jimmy Cliff clearly loves the music and performing and hardly stops moving throughout the night. Songs including "Wild world", "let your yeah be yeah" and "many rivers to cross" kept the party atmosphere going. Such is the strength of the songs that he was able to include "I can see clearly now" three quarters of the way through the set rather than saving it for the finale or an encore. The set ended with "the harder they come", "Bongo man" and an extended crowd singalong version of "Rivers of Babylon". The encore was four songs including "Sitting in limbo" and "Wonderful world, beautiful people", and at the end of the night it was clear that everyone had enjoyed a great night with some fantastic music from a great performer.